First, we must obtain the rights to use a biblical text from a local Bible Society for the language edition in process. theme finders adds another 1,200,000 words to this study Bible! All 1.2 million words have to be translated, edited for grammar, readability (understanding), and content assurance. countries where the FireBibles are being printed. Shipping to the end use site is arranged, customs and duties paid, and storage set up for distribution. A roll out ceremony is hosted on-site and we work hard to ensure maximum exposure across the Evangelical Christian spectrum. As you can tell from this list, there are hurdles to overcome for each FireBible to be completed. There are personalities, cultural differences, and many other challenges that arise during these negotiations and processes. Each FireBible is really a miracle…a miracle that we can navigate these steps, that each language is completed, and we are able to put them into the hands of pastors and leaders around the world! 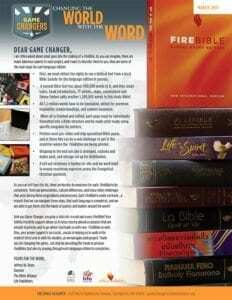 And you Game Changer, you play a vital role in each and every FireBible! Your faithful monthly support allows us to keep moving ahead on projects that are already in process and to go where God leads us with new FireBibles as well. Also, your prayer support is so crucial…crucial in helping us to walk in the mind of Christ and in with His wisdom, as we navigate each project. Thank you for changing the game…not only by providing the funds to produce FireBibles, but also by praying through each language edition to completion.